Through my Thursday scan of the Pioneer Press, I found this article Free Bus could face identity crisis, indicating that some in Niles no longer want to fork over the $600K a year for it. Of course, "Niles paying the fares" is only 40% of the cost, with Pace coughing up another estimated $900K. While the latter theoretically isn't affected by Niles asking for fareboxes, one knows that imposing a fare will drop ridership. Hence, this recovery ratio game may be over, similar to Oak Park dropping its shuttle and Schaumburg limiting the trolley to Friday through Sunday. That is a nice service they have. Maybe they could reduce some of the costs by changing some of the routings of the buses. Maybe instead of it running through the mall drives in front of every store they could have it travel to one or two spots within the mall like what PACE does with it's #270. They could also look at bus frequencies maybe by cutting some of that they could save the service and save some money too. There was some mention in the Niles Milwaukee Ave. BRT plan of having a new terminal at the north end of Golf Mill, so that buses could get in and out easier from both Milwaukee and Golf. However, as far as cutting down stopping at store fronts, I don't think that saves much time, and probably would lose the main source of business (i.e. older people going to Golf Mill, the two Walmarts, Village Crossing, or the new Meijer). The "older people" observation raises another that I'm sure sw would raise: i.e., since these are theoretically Pace fixed route services, would Free Rides for Seniors still apply? Or would these have to be converted to demand based community services to get around that stricture? I would think the chance for a one seat ride to your destination (plus it's free) would draw the riders. Why drive down in front of meijer's (on the mall drive)instead of just stopping at the lights or posted stops like the #208 does? It would save minutes. Considering (1) there is slack time in the route, as it has to meet the two 411s at that great French store J.C. Penney, (2) and, as I mentioned, the use of the bus by the elderly, that would defeat the whole rationale for the bus. There is a proposal on the Pace Active Bids page for a consultant for ART Niles Community Circulator Modernization. While the usual procedural stuff, the goal of the project is so that the Niles Free Bus better connects with existing Pace services and the proposed 270 ART, while cutting down duplication. I doubt, though, that the conclusion will be that both 270 and 411 not serve Jerry's. The consultant basically has 12 months to propose a plan. Pace has a page up for this restructuring, including a brochure and survey. Being patriotic, I took the survey for someone who claims not to have access to a computer. It also says that the Milwaukee ART is scheduled for 2016. Looks like the proposal is on Survey Monkey. The map indicates that the 411 circulator will be changed to 411 taking the west part of the route, while 413 would take the east part of the route, with both running between Golf Mill and Village Crossing. * The only change to 412 seems to be not covering the residential area north of Walmart. The part of 413 that now serves the Howard industrial area also appears to be discontinued. 30 minute intervals instead of some 30s and some 45s. *Of course, no reason not to assume that they would not be interlined. Ever notice, Niles buses DO have fareboxes (the little Diamond dropboxes), plus Ventra readers. I was quite surprised by this, too. But I guess this is sort of planning ahead, in case the bus is transferred elsewhere? The time I saw 2601 after it was transferred from wherever, it did not have a fare box, including the type of tin can that was on the Westmont ones. Update: The reason I looked at that one was that it had just been transferred from Downers Grove, and it certainly didn't have the cylindrical glass one it had at DG. 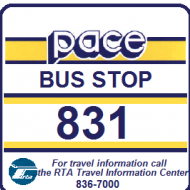 Despite having been told that this is off pending implementing Pulse, Pace has posted a page and public hearing notice on the Niles Free Bus restructuring. It looks at though what was originally proposed as 413 is now 410, but not much else is different. Little more explicit that the bus pulls into Tony's. The attached schedules state that 410 and 411 flip at Village Crossing and Golf Mill, so my prediction that it was essentially an interlined circular route remains, just that it won't be the "Regular Route" and "Reverse Route." The page says that this is supposed to be implemented September 27. Someone told me Sunday that a driver told her this wasn't happening. Although it was mentioned in the 2016 budget as "planned for late 2015." (page 84), Sept. 27 has come and gone, and the cited web page has gone blank. I saw a route 412 bus last night with holiday lights and a wrap. Too dark to get a fleet number, though. A nearly yearlong project to revamp the Niles Free Bus system will be implemented during spring, 2016, following multiple rounds of public input during 2015. "Ordinance authorizing the Executive Director to implement the proposed Route 411, 412 and 413 service changes effective in the Spring of 2016." That's definitely correlating to the next available pick (or at least one that makes sense). Trib Local* (or whatever) article that the Village Board had to approve it, which might have been the holdup; also some service to Maynard Road will be maintained. In that the service is run by village employees, I don't think the pick has anything to do with it. Update: Details are contained in this board packet (starting page 14). I'm not sure if this means anything, but yesterday (Sunday) a northwest division driver was driving the 412 route. One of the Niles drivers was with him. Finally announced: The Niles free bus modernization starts May 2. One thing that appears new is that the 412 buses (other than the 2 that go to Huber) go to the Terrace Square Apts, behind Golf Glen. So i wonder if that will affect the fleet count at Niles? That isn't too hard to figure out. Now the system needs 8 buses and has 11. The 411 schedule has 3 pullout in each direction on 411 (410 is interlined with 411). Time to get back to the terminal after running a 410-411 loop needs 3 buses each way. Hence 6 buses. 412 needs one bus (35 minute interval instead of 30). There is always the issue of midday pullins and outs, but theoretically one fewer bus is needed, because 413 is eliminated. Pace confirmed this here. In the section "Service proposal", there is a mention of "one fewer vehicle". Now we'll have to see whether they send a bus somewhere else or keep it as an additional spare. 2601 is probably gone (no free bus decals). Moving Forward comments that "When riders begin using the modified Niles Free Bus system on May 2, they can take pride in the fact that they played a significant role in the new service plan- whether they contributed directly or indirectly.."
I filled out a survey for someone who lived in Niles. but is now dead. I also helped someone fill out a survey saying she goes to Meijer, which is closing. Does that make it all invalid?